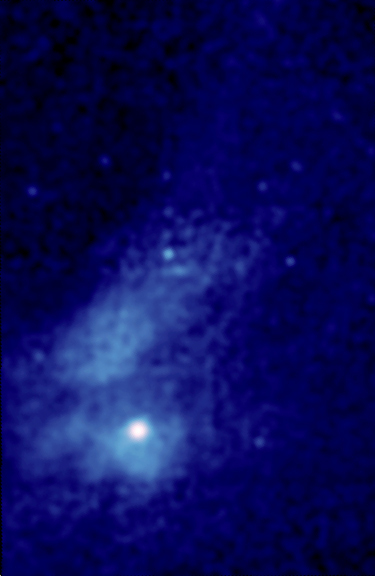 This composite X-ray (blue)/optical (orange) image of M86 shows gas being swept out of the galaxy to form a long tail more than 200,000 light years in length. Located in the Virgo galaxy cluster, this enormous elliptical galaxy is moving at about 3 million miles per hour through diffuse hot gas that pervades the cluster. The supersonic motion of M86 produces pressure that is stripping gas from the galaxy and forming the spectacular tail. M86 has been pulled into the Virgo galaxy cluster and accelerated to a high speed by the enormous combined gravity of dark matter, hot gas, and hundreds of galaxies that comprise the cluster. The infall of the galaxy into the cluster is an example of the process by which galaxy groups and galaxy clusters form over the course of billions of years. The galaxy is no longer an "island universe" with an independent existence. It has been captured and its gas is being swept away to mix with the gas of the cluster, leaving an essentially gas-free galaxy orbiting the center of the cluster along with hundreds of other galaxies. M86 is an unusual galaxy in that it is one of a small number of galaxies that are moving toward Earth, rather than receding with the general expansion of the Universe. This expansion is carrying the Virgo cluster away from us at a speed of about 2 million miles per hour, but M86 is falling into the Virgo cluster from the far side of the cluster, giving it a net velocity of about one million miles per hour toward Earth. Coordinates (J2000) RA 12h 26m 12.00s | Dec +12° 57´ 00.00"